Architecture in Times of Need documents the projects and progress made by the Make It Right Foundation, established by actor Brad Pitt, in response to the destruction wrought by Hurricane Katrina of homes throughout New Orleans" Lower Ninth Ward. Architecture in Times of Need focuses on the redevelopment of New Orleans’ vibrant Lower Ninth Ward which was severely devastated by Hurricane Katrina in 2005. Invited by the Make It Right Foundation, formed by Brad Pitt and GRAFT, a group of high-profile and influential international architects set about developing affordable, green housing for the area, incorporating the latest in innovative and sustainable design. The projects by David Adjaye, GRAFT, MVRDV, and Shigeru Ban, among others, are shown in numerous photographs and renderings with sketches, building plans, and informative commentary by the architects. Along with an interview with Brad Pitt on his motivation to start the Make It Right Foundation to help in New Orleans’ reconstruction, the book also includes essays on the overall design process and describes the sustainable Cradle to Cradle approach, which seeks to maximize economic, ecological, and social value by following principles inspired by nature. 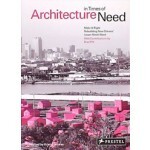 Architecture in Times of Need also features the Pink Project, a unique effort that directly connects monetary donations to the assemblage of houses. It brings to fruition an idea based on real needs and real people, and in reaction to a natural disaster, the recurrence of which is all too possible.